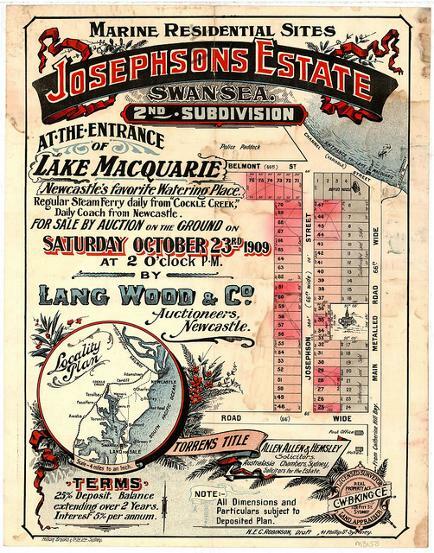 Josephsons Estate, 23 October 1909. From the Northumberland Permanent Building Investment and Loan Society, University of Newcastle, Cultural Collections. 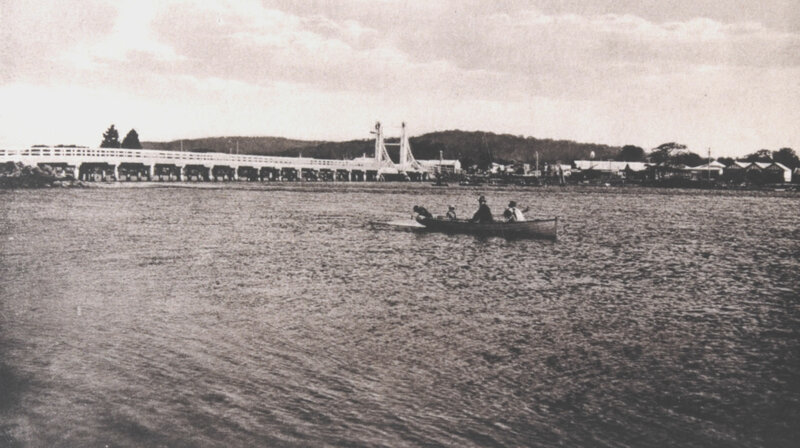 Swansea Bridge, Lake Macquarie.From the Newcastle and Hunter District Historical Society Archives, University of Newcastle, Cultural Collections. 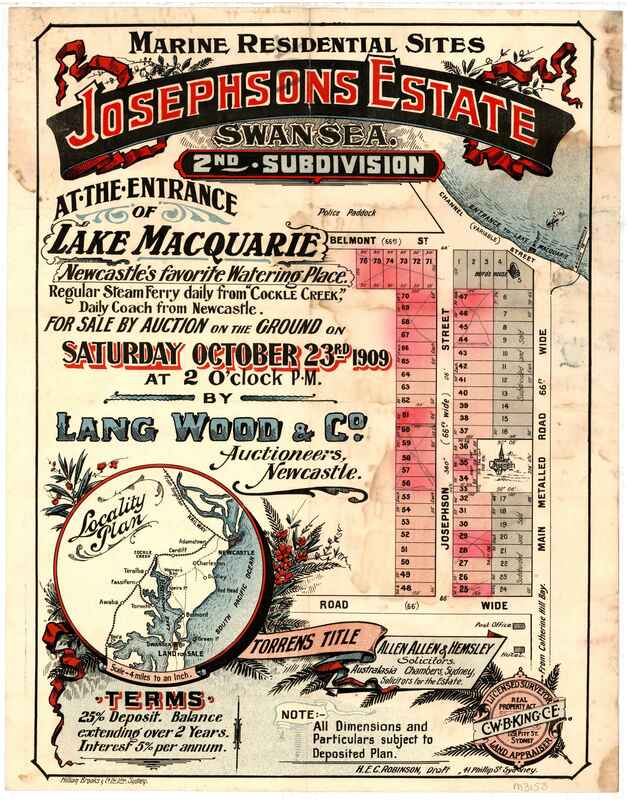 The Aboriginal name for Swansea is Galgabba, and the nearby Black Ned’s Bay was home to Margaret and Ned of the Awabakal and their descendants. Swansea was originally known as Pelican Flats. 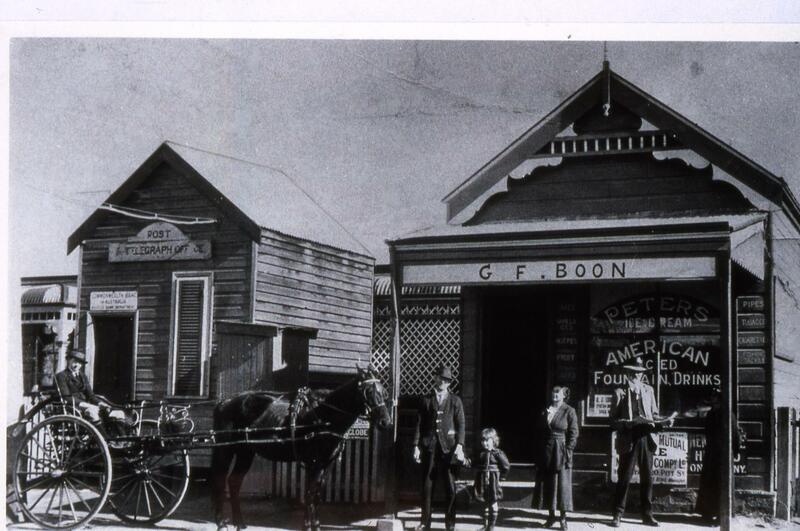 The Post Office at Pelican Flats was opened in December 1879, and in 1887 Pelican Flats changed its name to Swansea. Early settlers included the Boyd, Taaffe, Boughton, Parbury and Josephson families. There was an influx of Chinese migration in the 1850s. Reverend Lancelot Threlkeld built his coal loading facilities for his Ebenezer Mine at Swansea Heads in 1841. Some coal companies operated in the area, included those of Messrs’ Lamb, Knox and Parbury, Pope and Hardie, Copeland and Amos and Murray and Co. The town was the base for workers involved in dredging and building breakwaters to improve the navigation for the entrance of Lake Macquarie. The first bridge was completed by 1883. It was replaced by a second in 1886, which was again replaced in 1955. In 1989 an additional bridge was built for southbound traffic. Post Office and GF Boon Store, Swansea, [early 1900s]. From the Dr John Turner Collection, University of Newcastle, Cultural Collections.